Organize your promotions, images, content, banners using the tabular interface of the Homepage Content Slider module. The slider can be inserted into Homepage or any other CMS page or static block. The module is adjustable. 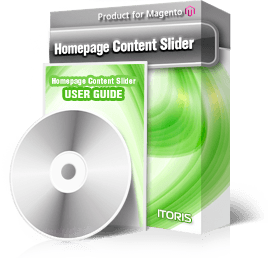 With Homepage Content Slider you can create a set of banners that will redirect your customers on click, or beautiful image gallery, or a set of content slides. Both the slides and previews in tabs can contain images, texts and links. Several pre-created design schemes are available to meet your website’s design. Tab previews can be located on top, bottom, left, or on the right. Enable auto rotation and set the delay in seconds. Great sliding effects. The slide content can be edited using WYSIWYG, widgets allowed. Show different slides for different customer groups. Or limit your promotion on time (from-to dates). Reorder slides directly in the list.